We are thrilled to be venturing on a new long-term co-publishing collaboration with Naranja Librería y Editorial, a Chilean publisher and bookstore dedicated to the creation, marketing and distribution of artist books, object books and experimental publications. The first edition produced under this partnership will be Tentativa de la Razón by Sebastián Barrante, debuting this weekend at Codex VII in Richmond, California. 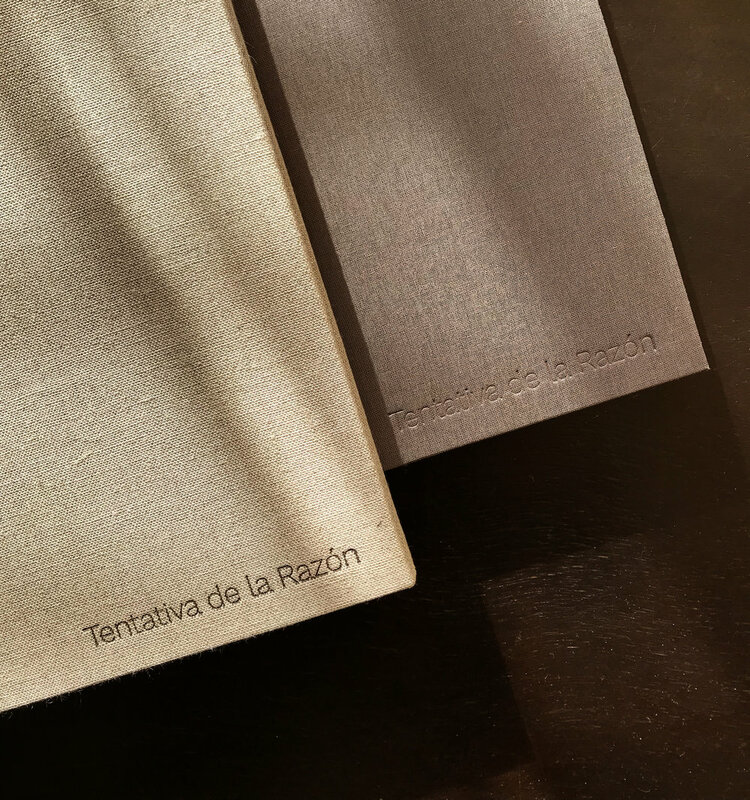 Tentativa de la Razón is an edition of 14 unique works on paper created by Sebastián Barrante, each encased in a tri-fold windowed portfolio and protective slipcase. Each piece comes with an inventory pamphlet contextualizing the individual work and the complete edition. I wrote phrases related to the narration my father told me once about the period he lived at jail, after being imprisoned and tortured by agents of the DINA (Direction of National Intelligence) during the Chilean dictatorial regime (1973-1989). Until the moment of his narration, I had scarce information of his experience, I never wanted to inquire into this period of his life, since I knew it was something painful to remember. Until, due to an investigation about a character which portrayed a political prisoner and that I had to personify while studying theatre, I decided to shyly ask him about how that experience had been. This narration stayed in my mind in phrases, and those phrases are the ones which I started to write, fifteen years later, as a mechanism of mental detachment from this painful experience. The unknown image that randomly emerges, is what encouraged me to photograph periodically the sediments left by the coffees I drink while I work or think in ideas to carry out. When those residues accumulate in the bottom of the cup, random images are produced, having the virtue—as any other image—of being interpreted. I do not know how to read them, but the fact that they might eventually “tell me something” make them an interesting topic of investigation. This is how, from the digital registration of the sediments left in every cup I drink, I moved to an analogue registration by spreading this sediments in paper pages. Image or representation of the perceived object that remains in the subconscious. Events that will never be erased from my mind. Intuitively, I decided to spill the coffee sediment on the paper I was working on and realized that these two creative processes made much sense by being together. I believe that the sensation given by the images formed by the coffee sediment in the paper is related with the intrigue of knowing its meaning and also with my father’s narration which I would like to wipe out. Thinking the word as the manifest of a subsystem. Manifesting the phrase as means of thought interlocution. Thinking the book as an objectual articulation of a mental state. The book as a support of ideas. The object as an idea of a book. The page as body prosthesis. Thinking the material as textual translation of the word. Occupying the space as the page of a book. The object as resignification of the residue. The residue as reconsideration of support for art. The residue as image of a reflection of the page. The reflection(s) as residual text. The image as residue of my reflection. The object reconsiders the artistic support to convert it in thinking body. Sebastián Barrante is an artist photographer graduated from the School of Arts of The University of Chile, with later specialization in editorial areas, artistic book binding and exhibition curatorship. These specialties have allowed his professional development in artistic creation with an emphasis on the image and the book; the management of cultural projects related to photography, documental archive and the creative editorial industry. In the artistic field, his work has moved from his photographic specialization in the digital sphere to the investigation on image in artists’ books. Under this same area, he creates Naranja Bookstore & Editorial (www.naranjalibreria.com), a space of creation, commerce and dissemination of artists’ books, object books and experimental publications. His artists’ book are part of the Fundação Serralves (Porto, Portugal); Archive Artist Publications (Munich, Germany); Cerrillos Contemporary Art Centre (Santiago, Chile); and Bavarian State Library (Munich, Germany).